You might have heard about RCS or recall us writing about it in an earlier blog post. To recap, RCS stands for Rich Communication Services and is set to be the evolved version of SMS, presenting us with features like group chat and media sharing that some third-party messaging apps do now but this will become the standard messaging app on mobile phones. Last October, Telstra became the first Australian telco to offer RCS. Though it is only available within the company’s own network, and to a handful of handset models, it’s nevertheless, a step closer for us to embrace this new technology. At Esendex we are very excited about RCS, particularly as we are part of Google’s early access program for RCS Business Messaging. As a business, there are some great benefits RCS can bring to your communication strategy. Here are the top 3. A feature of RCS Business Messaging is ‘verified sender’. 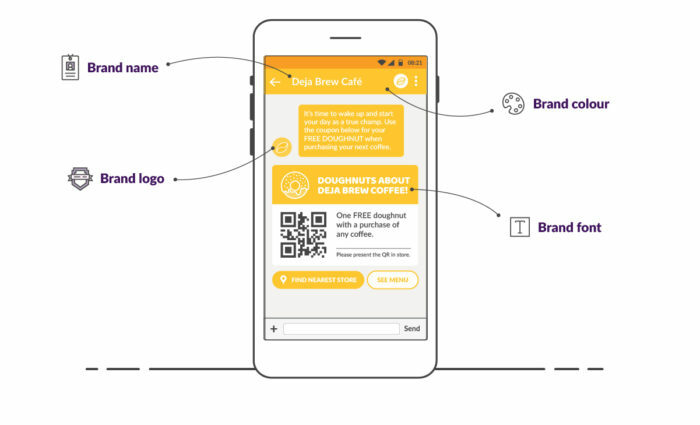 Any brand or company that wants to send RCS messages to their customers will have to go through a rigorous verification process. Once verified, they will be able to use their official brand name, logo, brand colour and font for all their messages. This would definitely be beneficial to both businesses and consumers as we fight against scam messages like this. Chatbots have gained traction in the last year, with brands like the Australian Open and Domain adopting this technology into different aspects of their customer journey; and seeing great results. However, the use of chatbots now still relies quite heavily on social media channels, and for some consumers that is a turn off. With RCS’s functionality to integrate chatbots, brands can bypass third-party platforms and be able to use bots to provide real-time answers to customer enquiries. According to the Ad Week, real-time personalised messages are key for marketers. In fact, a report by EY revealed that despite concerns about privacy, 68% of Australian consumers still expect organisations to know them, personalise their preferences and filter what information is being delivered (source). RCS allows businesses to provide a wide range of real-time and tailored information, from product details and answers to customer queries to appointment booking, all at the touch of a button within the messaging app. As part of Google’s Early Access Program, we have the privilege to help shaping the platform’s capabilities. And our customers will be among the very first companies to be able to send RCS messages using our online platform or via an API. For the meantime, stay tuned for more updates on the development of RCS; or get in touch with our sales team if you would like to have more information.